Nursery Names design bespoke prints for children's (or adult's). Specialising in alphabet cards and designs and personalised illustrated name prints. The name prints can be full customisable and they will even colour match your room, cushions or furniture, the designs are unisex and fun. Nursery Names was set up by illustrator Emily after she was inspired when creating a name print for her niece to celebrate her birth. She spotted a gap for contemporary, modern, bold and colourful name prints and designs and so decided to launch the company. WHY WAS IT CREATED: After creating a name print for my niece 3 years ago and getting lots of subsequent requests from friends and family I saw a viable business to create custom name prints that bucked the trend for twee pastels and had a more contemporary unisex feel. I created the full alphabet and launched the site about 6 months after my first name print was made, I have fond memories of working on that first print late into the night just so i could take it with me to my hospital visit the next day to meet my niece for the first time. I think the adrenaline of becoming an aunty helped : ) I am still adding new letter options to the website as the project grows and develops, often taking on board suggestions for new letters through my customers which is a fun way to engage with them and gives me more motivation to create. WHAT WE NEED TO KNOW ABOUT YOUR BRAND: I am not a mum yet, but hopefully one day ( when I hope i will be) I don’t believe my tastes & style will change, i decided to create something that i would want to hang on my wall and hoped that design concious parents would feel the same way, creating something contemporary with some more unusual/quirky letter options was important to me. I was also keen to create something that had a universal appeal to boys and girls and something that could grow with the child (so nothing too babyish). I hope the prints can easily make the transition from a baby's nursery to a more grown up kids space. WHAT WE SHOULD BUY FROM YOU: Our best sellers are the customised name prints especially for new borns, you can even now have a play around at previewing your chosen name through our website on the dedicated PLAY section (this section works best on a desktop). I always send proofs out to customers before printing custom names and although we have developed a palette that works in unison with all the characters we are happy to play with colours so people have something completely unique should they wish. In the past i have colour matched from a swatches of wallpaper, cushions and books with great results, this service does cost an additional £15 but has proved very popular with parents . 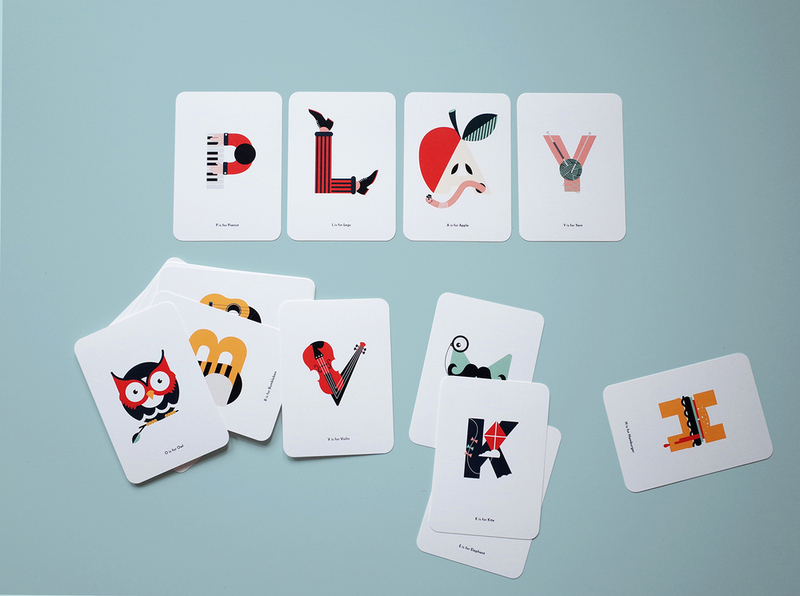 We also sell full alphabet prints and flash cards straight off the shelf that make lovely educational gifts for toddlers and beyond.